The Tower Bridge tanker, which was built at the local Admiralteiskiye Verfi state-run shipyard, will be transferred to its owner, namely, the Sovcomflot association, in an impressive setting here today. Talking to RIA Novosti, people at the shipyard's press center noted that the Tower Bridge, which was intended to navigate ice-free seas, had a total deadweight of 47,400 tons. The new tanker can simultaneously carry up to five different consignments, including crude oil, petroleum products, cooking oils and animal fats. This state-of-the-art cargo ship has a maximum range of 15,750 nautical miles. The Tower Bridge is fitted with automated ship-control systems, as well as other systems for controlling its machinery, other technical means and board systems, as well as cargo-handling operations. Unlike other ships in this series, the Tower Bridge boasts an improved design and a more sophisticated navigation complex on its bridge. It can therefore be handled by only one person. The Tower Bridge tanker, which was named in honor of London's famous Tower Bridge, is the third in a series of tankers being constructed at the local Admiralteiskiye Verfi state-run shipyard on Sovcomflot orders. All ships in the series are named after the world's most beautiful bridges, whose names begin with the Latin letter T, in line with the client's wishes. The prototype ship, i.e. the Troitsky (St. Trinity) Most (Bridge) tanker, was received by Sovcomflot in December 2003. This tanker now operates between the United States and Western Europe via the Gulf of Mexico. The second ship, in the series, i.e. 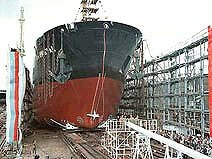 the Tuchkov Most, was transferred to the client April 28, 2004. One such tanker costs more than $30 million on the international market. Business news archive for 22 December' 2004.